Cycle Gear came out with their own line of riding gear called Bilt. The line includes affordable helmets, but I am not sure of the quality. I just picked one up and mean to try it out tonight. Does anybody have an opinion on them? I have not tried one of their helmets. But, as long as the helmet is DOT rated and fits properly, it should be fine. A proper fit is snug front to back and side to side. IIRC, Revzilla has some helmet fitting videos. Check out revzilla.com, before purchasing a helmet, for how it should fit info. Last edited by jsonder; 05-13-2015 at 08:42 PM. Ive found after about $100 your really only paying for comfort. That being said. I hate Bilt helmets. Worst helmet I ever bought. I have no doubt it will save me if I go down.... But blew air in my eyes, loud, and the visor scratched for anything. I would recommend getting something better than Bilt. But if its all you can afford than get one for now than keep it for a backup when you get a better helmet. I think that's what my plan will be. It was affordable for the initial buying spree (I just bought my bike last weekend) but in the future I'll probably invest in something better. Isaacm12 I noticed that it did blow air in my eyes and was loud unless I tucked. You should always ride with ear plugs. It's better for the ears. Honestly, I'm not a big Bilt fan, but you could search around for reviews from owners to see what they think. I'd look around for closeouts or discontinued name-brand helmets - HJC, Scorpion, AGV, etc. Styles and graphics change yearly, so there are always dated models that are being sold at discount prices. 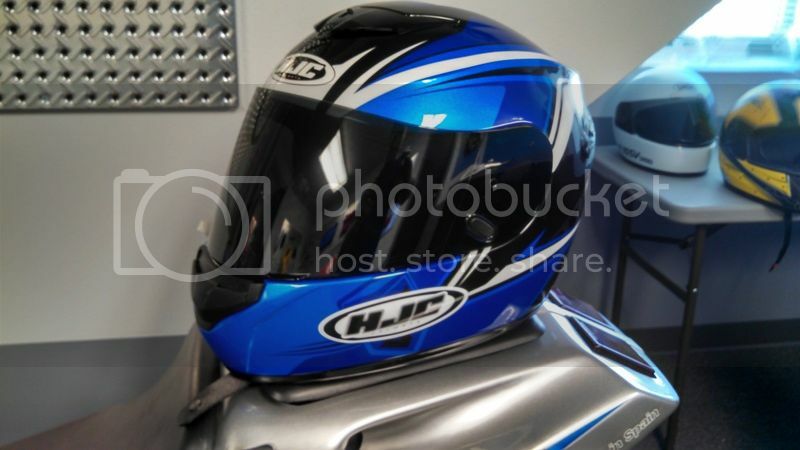 I recently purchased this HJC from Riders Discount for under $100. They are a sponsor here, and at another site where I'm a member, and can usually give you a special price if you PM them from the site as a member. The Bilt helmet I bought when I first got to Japan is utter ********************. I bought it because I needed a helmet for the military riding courses & it was the only one available at the NEX. Loud, windy, uncomfortable, and heavy! Ugh. But it only cost $75 and it was DOT rated. I'm now wearing a Kamui Ibuki flip-up. Love it for the most part, but eyeing the Shoei modular. Last edited by JacobAllison; 02-04-2016 at 08:49 AM. Reason: Oops, sorry for resurrecting a dead thread. I am using a bilt blaze now, got it from CG for around 60 bucks... First helmet i ever bought since i am a new rider. I'm looking to upgrade! After that first year of riding, I decided I hate my Bilt helmet. Loud, blows air straight into my eyes, and heavy. Come spring I will be buying an Arai or Shoei. Anyone use the Sedici helmets? From my understanding Sedici is Cycle Gears higher end brand, Bilt being their lower end.